Tropical flowers conjure up images of beautiful sandy beaches turquoise seas or lush rain forests. They always bring to mind strong vibrant colours, unusual shapes, fabulous textures and weird and wonderful names. You can create some amazing displays that really make an instant impact with just a few well placed stems and lots of sumptuous green foliage. Certainly creating a display using the exotic and sometimes rare can cost a lot of money, after all many of these flowers are imported from places such as Asia, South Africa and Hawaii.But thankfully some flowers which were traditionally regarded as tropical, such as Gerbera, Aorchids and kangaroo paw, can now be found in your High Street florist. And the oddly shaped anthirium can generally be seen in the local supermarket’s plant section! You may have to go further afield for the more unusual ones such as the wonderful and striking strelitzia (Bird of Paradise), ornamental gingers or heliconia – but they are out there.And thanks to improved air transport and excellent packaging, these blooms generally arrive in the country in excellent condition. But how do you keep these flowers in excellent condition before you use them? We are so used to storing our flowers in cool places. With tropical flowers it can be the opposite. After all they have come from countries where the climate is generally, sunny, hot and humid. Stick them in cooler conditions and they are very likely to deteriorate quickly. Ideally they should be stored at a steady room temperature, away from direct sunlight, radiators etc. It is an idea to mist them regularly so the flower begins to “think” it’s in a humid climate. A number of tropical or exotic flowers arrive with the base of their stems placed in small test tubes of water. You should remove them, recut the stems and place them in fresh shallow water which has been treated with flower food. Generally if they are stored correctly these flowers should last a long time. Chose your foliage well. If you are looking to do a minimalist linear display, bamboo, bear grass and eucalyptus are all ideal. If you intend your display to be fuller, palm leaves, fern and ruscus are all good choices. You can also bulk out a display with common flowers such as chrysanthemums or carnations. Small basket lined with waterproof material; block of floral foam and roll of pot tape; florist scissors and florist fix y(all available from any good florist); frog (plastic pin holder to secure foam in a container); five gerberas; four stems of liantrus; four stems of carthamus (Zanzibar);September; two sprays of chrysanthemums; eucalyptus; hard ruscus; palm leaves. Cut the floral foam to fit the basket, making sure that it is about two inches taller than the rimSlightly dampen it and use a knife to round off edges to create a slight dome effect. Secure frog to the centre of the basket lining base with floral fix and lower foam onto it. Tape foam in place attaching it to the container by criss crossing two pieces of tape off centre and bringing it back over the edge of the basket to secure. Place one of the gerbera at the back of the foam in the centre and place four more at a slight curve graduating down until the last one is placed sticking forward from the front of the floral foam. Place a large palm leaf behind the first upright gerbera and create a “triangular” outline shape by adding a palm leaf at the bottom of the display either side. Working from the back to the side add more foliage (cut to size) such as the ruscus and eucalypstus, ensuring that the outline shape is kept and the back of the display looks “solid”. 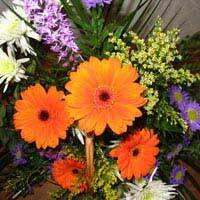 Add a line of liatrus following the line of gerbera from left to right and from right to left add a line of solidago. In front of the line of liatrus add a line of chrysanthemums. Continue to fill in with the carthamus and September ensuring that the shape of the display is kept and the flowers remain grouped. If there are any gaps (and they will be obvious!) fill in with foliage. You don’t have to use a basket. Striking vases either clear glass or brightly coloured can add extra interest. Anything goes really providing you’ve got your colouration right and don’t try to overdo it. Many of these exotic blooms don’t need added extras because they are beautiful in their own right.